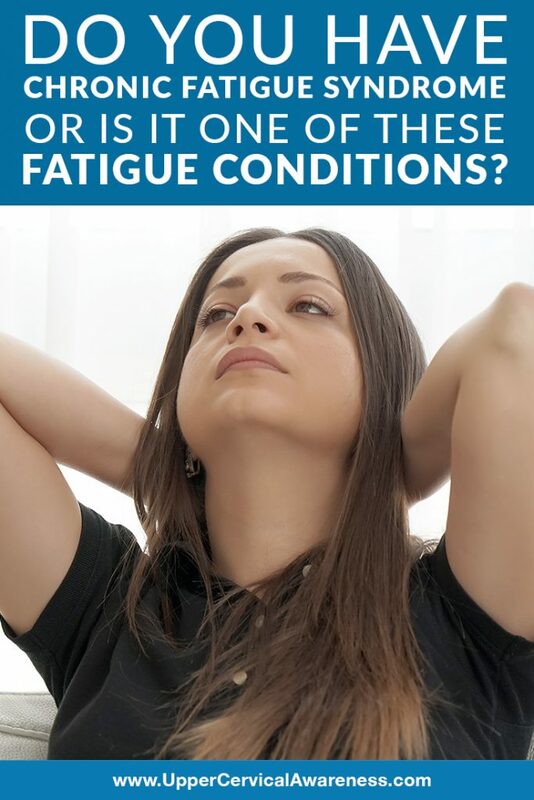 Do You Have Chronic Fatigue Syndrome or Is It One of These Fatigue Conditions? Home/Fibromyalgia / Chronic Fatigue Syndrome/Do You Have Chronic Fatigue Syndrome or Is It One of These Fatigue Conditions? Chronic fatigue syndrome is one of those conditions that stump the medical community. It can take years, not to mention a lot of money and frustration, to get an official diagnosis. A big part of the problem is that there is no one test that can tell you if you have chronic fatigue for certain. As a result, doctors want to rule out other conditions that cause extreme fatigue. We’re going to consider some of these conditions briefly, but we will then provide you with the hope that quality of life can be restored naturally if you do have chronic fatigue syndrome. Here are some of the things that doctors may look for before you can get a diagnosis. Many chronic fatigue syndrome patients also have OSA, so if you get an obstructive sleep apnea diagnosis, it doesn’t rule out CFS. However, OSA can also cause extreme fatigue on its own. This condition involves pauses in breathing while a person sleeps. Your body wakes up temporarily over and over throughout the night to restore proper breathing. You won’t even remember waking up. Most people only get tested for this condition when a mate or partner notices the sleep interruptions (they can be quite noisy). Proper OSA treatment can help you to sleep and reduce weariness. However, if you also have chronic fatigue syndrome, some of the fatigue will still remain, even if you sleep well at night. Diabetes is a condition that is characterized by high amounts of glucose in the blood. These elevated sugar levels can cause exhaustion as well as a host of other symptoms. For example, you may find that you are always thirsty and that you have to urinate more often (and more urgently) than usual. A simple blood test can help diagnose diabetes, and there are medications as well as dietary changes that can help keep the condition under control. Regulating blood sugar levels should also restore your energy levels. Anemia occurs when a person does not have a sufficient supply of red blood cells. For women, this can occur during her period if she bleeds too much. However, it can also be a chronic condition or one that a person is genetically predisposed to. The good news is that there is a simple blood test to check for anemia. Also, there are supplements and dietary changes you can make to correct and control this condition. Once the body has a sufficient supply of red blood cells, it can once again get enough oxygen, and the weariness should go away. It is common to experience depression along with chronic fatigue syndrome and other chronic health conditions. So once again, you cannot write off CFS just because you have depression. However, depression can leave a person feeling lethargic on its own. Between feeling sad, having problems concentrating, not feeling like eating, and the other symptoms of depression, it is easy to see why you would feel tired all the time. If you are experiencing these symptoms, especially if you are also experiencing thoughts of suicide, call a help hotline or contact a physician immediately. Hypothyroidism is a fancy way of saying that a person’s thyroid is underactive. Since this gland is in charge of regulating a person’s energy levels, it makes sense that reduced functionality would lead to fatigue. The symptoms of hypothyroidism and chronic fatigue are very different, so other than the exhaustion, it should be easy to tell these two apart. For example, hypothyroidism is usually associated with constipation, dry skin, and unexplained weight gain. This is also another condition that can be diagnosed with a blood test and treated with medication and supplementation. The adrenal glands produce hormones that help you to deal with stressful situations. While cortisol gets a bad reputation, it’s only bad when you have too much of it. You need to have a little on a consistent basis in order to regulate your metabolism and blood sugar and to reduce inflammation. It’s also important for your memory. Adrenal fatigue or adrenal insufficiency can cause extreme exhaustion and a host of other symptoms that can mimic many chronic health conditions. This can also be measured by a blood test. Ultimately, if chronic fatigue syndrome ends up being the diagnosis, you may feel trapped. You spent all this time and money just to find out that you have a chronic health condition with no known cure. However, there is hope. In case studies it has been revealed that upper cervical chiropractic care can improve the quality of life for patients with chronic fatigue syndrome as well as other chronic health conditions like fibromyalgia. If you are dealing with chronic fatigue syndrome, upper cervical chiropractic may offer some natural help to restore your ability to carry out normal daily activities. It is a safe and gentle subspecialty of chiropractic with none of the popping and twisting you may associate with this type of healthcare. The focus is on the top two bones in the neck. Misalignments in this sensitive area can affect everything from blood flow to the brain to brainstem function. Correcting the misalignment can maximize central nervous system potential and allow you to deal with your chronic health condition more effectively. Schedule a consultation with a practitioner near you today and see if we can help you get your life back. Dr. Perkins2019-02-02T17:23:07+00:00December 23rd, 2018|Fibromyalgia / Chronic Fatigue Syndrome|Comments Off on Do You Have Chronic Fatigue Syndrome or Is It One of These Fatigue Conditions?